Today some wisdom from one of our best modern “philosophers”: xkcd. If you’ve never dipped into the webcomic (sometimes-daily snippets of web basic comic strips) then may I suggest you start with this one? Creator Randall Munroe is a one of those smart nerd-guys we appreciate for using his brain for more than a decorative piece. How are your behaviors deterring people from reaching full potential and depriving you of the opportunity to explore the world with them? In the name of making ourselves look smarter/cooler/more knowledgeable our culture is prone to ripping others down – but how much more awesome is it to have the privilege of imparting new knowledge and the excitement of learning on another adult mind?! I’ve spent much of the last year learning about physics and human movement, and because of my job I often get to teach people about their own bodies. It’s one of my favorite things about my job. What can you teach the people in your life? 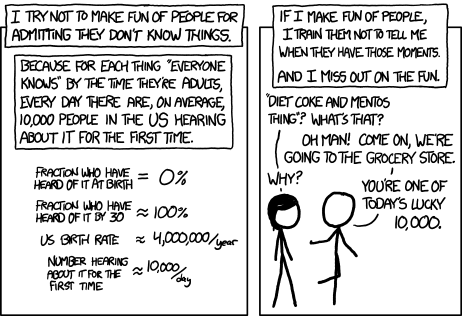 About XKCD: due to his math, physics, and programming background it’s inevitable that some of his jokes are going to go over the head (yours, mine, everyone who doesn’t work for NASA… and probably some of those guys too) but I strongly suggest hitting the Random button on his comic a few dozen times and soaking it in. This one I just couldn’t help but share.